Happy Thanksgiving weekend! Hope everyone had a great holiday. 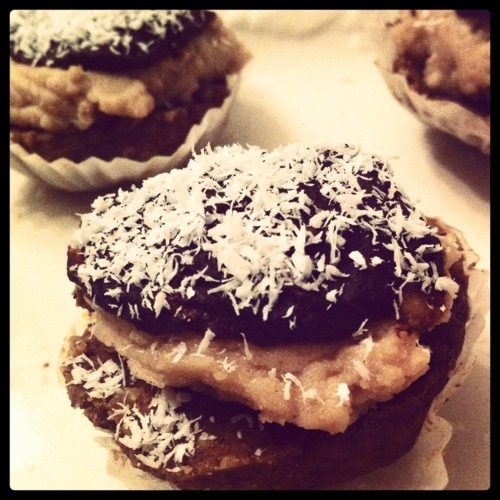 For a veg-friendly tgiving dessert this year, I decided to try this raw cupcake recipe from the Pure2Raw twins. As it requires many steps, this was probably my most ambitious raw cooking experiment to date. 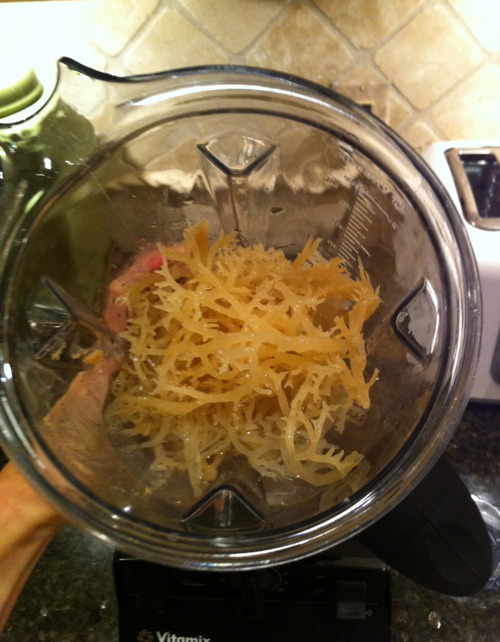 The first step in the process—which I managed to do the night before—was to prepare the irish moss paste. Irish moss is a mineral-rich seaweed utilized by many raw pastry chefs as a thickening agent, owing to its gelatinous properties (for a full explanation, click the link). As you can imagine, this requires extensive planning ahead, since you will most likely have to order it online (unless you’re lucky enough to live in a vegan-centric city). You will then need to soak it up to 24 hours to clean. After first discovering and reading up on its splendiferous properties, I was intrigued and excited (if not a little daunted) to try it out. It also serves as a nut substitute, so is a good way to cut down on your nut intake (though nuts are healthy in moderation…in a vegan diet they can add up quickly!). *If you do not have the time or patience to deal with the irish moss (which I completely understand), you could simply add in more nuts or use coconut flour in its place. If you DO decide to make the effort, the good news is you can freeze the leftover moss for use in future desserts! Pulse all ingredients together in a blender to create the batter. For the frosting, I used this coconut recipe, as well the following pumpkin carob sauce to top if off. 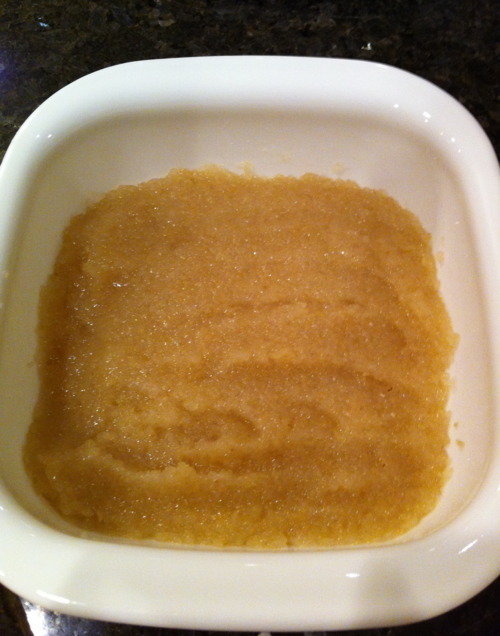 *This was my first time using lucuma powder as a sweetener. It has a maple-like flavor and is naturally low in sugar, so I loved it! 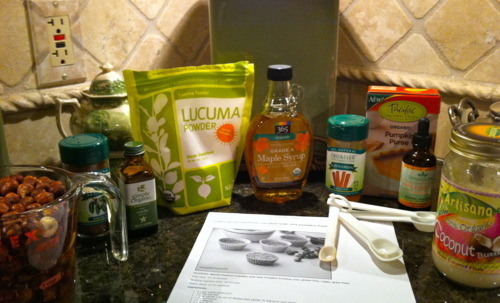 However if you do not own lucuma, you could use a few drops of stevia or sweetener of your choice as an alternative. Finally, I blended the ingredients for the frosting in the Vitamix, and whisked the sauce together in a bowl. Pure2Raw recommends using reusable silicone cupcake baking cups, which I will definitely use next time as I made the mistake of using flimsy paper ones. yay glad you liked the cupcakes!! yes a little time consuming making the irish moss paste, but it is worth it.